The wine has a dark ruby color. 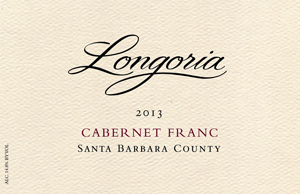 The nose boasts the classic Cabernet Franc herbal overtones with hints of ripe black cherries, anise and woody notes. On the palate, the wine is immediately rich and full-bodied, with an extracted texture and flavors similar to the aromas. Subtle oak tannins combine with the fruit tannins to give lift to the flavors and give the wine a long finish. Pair with brie, roasted tomatoes sprinkled with rosemary, or Bolognese made with lamb and pork. From Patrick Wright of Orange, California on 1/10/2017 .